Ever wanted to see what was going on in your home while away? If you travel a lot and want to make sure that everything in your house is copasetic then the izon home monitors might be what you want to pick up. Stem Innovation, the creators of the izon home video monitors have a line of Wi-Fi video cameras is to connect your physical world to your phone. 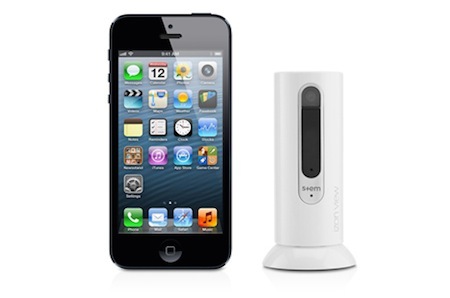 The izon view and izon 2.0 are Wi-Fi enabled video cameras that can be easily setup anywhere in your home or office. Using the companion app, you can stream video and audio to your iOS device, giving you the ability to be there, even when you’re not. The izon view, which features night-vision, is available for $99.95 and the izon 2.0 sells for $79.95. Both cameras can be purchased from www.izoncam.com and offer the same compelling and leading-edge technologies as the more-expensive, category competition. The izon view has a night vision feature that uses it LED’s on the front of the camera offer enhanced night vision for monitoring in the dark. You download the app on your iOS device. 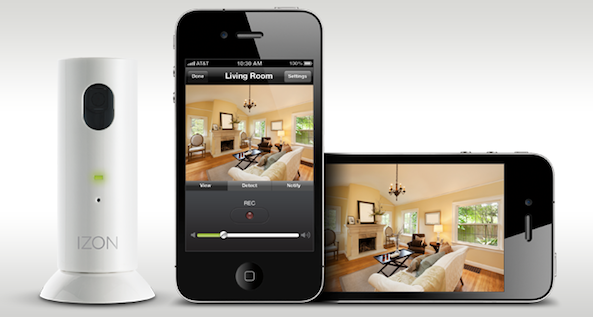 It is fully customizable user interface that includes push notifications for motion or sound. You can use it anywhere in your home. For use on any flat surface and can be mounted to a ceiling. It tilts and swivels easily on its unique magnetic base. I liked how easy it was to setup. I didn’t need a computer and it was setup in minutes. It connects through your local wireless network. It sells in white or black. I like the view a lot. I had it for a week so far. Once the view was set up in a matter of minutes I walked around my house testing it out. No matter where I went I was able to see what was going on in the room where I set up that camera. The next step was to see how the view would stand up when I was away from home. No matter how far I was away the view gave me a picture perfect look into my home. Whether I was a town away or in another state I was able to check in. Talk about getting some peace of mind. It is nice to add some extra security if you are away or at home. I like the fact that you can even record from your iPhone or iPad when you have the app up and running on our device. If you are looking to pick up a security camera for your home make sure you check out the view from izon. For more info click here! Print article This entry was posted by Art Eddy III on November 2, 2014 at 2:40 pm, and is filed under Lifestyle. Follow any responses to this post through RSS 2.0. Both comments and pings are currently closed.